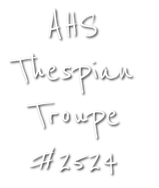 Thespian Thursday is a weekly meeting held for current thespians and those who want to be fellow thespians. These meetings are held to update everyone on the events. Everyone who wants to be a thespian or is a current thespian should be attending these weekly meetings. Note: Thespians who are not attending these meetings could become inactive. Contact Mrs. Nitschke for any questions.